Autosport Labs :: View topic - Mounting bracket? 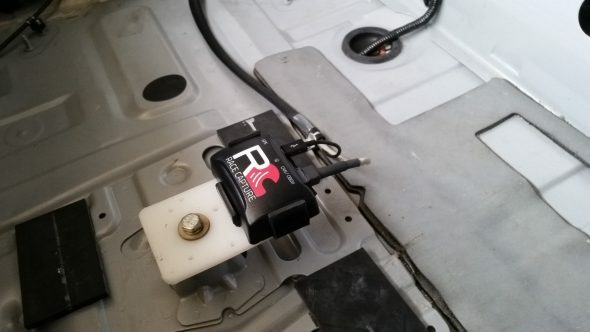 Autosport Labs Forum Index » RaceCapture/Track Installation » Mounting bracket? There was a post on the Autosport Facebook page with a really nice installation in a 370Z. Looks like a custom bracket was used to hold the Racecapture unit - does anyone know anything about the bracket? Thanks! Hi, we actually uses a RAM mount with a L-shaped bracket. the L bracket has a hole that sandwiches on the thumb screw in the middle of the RAM mount extension arm. Then, the RaceCapture can sit on the top part of the L bracket. It would be pretty simple to build this out of some bar aluminum, but having a kit would make it more compelling, for sure. Let us know if that's enough information to get you started and what you end up working out! Thank you very much for the reply. That is a nice way of mounting the RaceCapture - I assume you would secure it to the L bracket with straps or some high-strength Velcro? Unfortunately, while that will work for autocross, our local BMWCCA chapter has a high bar for securing items in the car. For example, we don't allow suction cup mounted cameras - they must also have a metal tether to prevent them from flying around the cabin in an OTE. So, I am exploring other alternatives for mounting both the Racecapture and the 7" Kindle Fire I'm going to pair with it. It looks like there's something the Racecapture can snap into that attaches to the white plastic piece - that's the component I'm particularly interested in if you have any additional info on it. Oh, that bracket. That was made by one of our customers - it looks like a flat piece of metal or plastic. Not sure how it's attached. Please do share whatever you come up with - will be interesting to see! Yep, looks like there is some sort of custom holder for the RaceCapture that is attached to a plastic piece that is then bolted to the chassis. The custom holder is the most interesting part. I was considering trying to 3D print one, that'll make for an fun project. I'll try to report back on what I ultimately end up doing. One suggestion for future revs - perhaps put some 'ears' on the base of the RaceCapture with holes for screws/bolts. A number of racing organizations don't allow suction cup mounts for cameras. That's why RAM, for example, makes roll bar mounts that clamp to a bar. Absolutely. My GoPro is mounted to the rollbar in my car in addition to having a tether for exactly that reason. I'm not sure I have a good place to do something similar for the Racecapture though, doesn't it need a good view of the sky? It can't be covered by metal. But plastic should be transparent to the satellite radio frequencies and so, of course, is glass. What about hook and loop type fasteners instead of suction cups? Industrial hook and loop fastener is a good option, too. The alternative to hook and loop is the Scotchbrand type fastener. I use it for my GPS and now for the RaceCapture. The glue side has stuck to my vinyl dash for several years now. I did carefully clean the vinyl before attaching. Nice, got pictures of the installation? Pictures taken through the windshield so there are some reflections. Nice. I really like that stuff too, much more positive hold than hook and loop with virtually no play. As soon as I get my car back from the body shop (neighbor hit it while it was parked!) I'll play with some mounting ideas. That stuff is tremendously strong; sometimes strong enough to just peel off the adhesive!